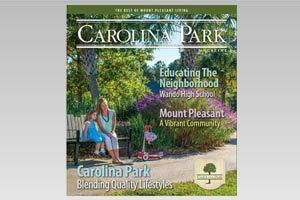 MUCH OF SOUTH CAROLINA and North Carolina have seen a population boom in recent years, with builders putting up housing developments as quickly as possible, then moving on to the next project. Despite its proximity to Charleston, Johns Island, located just across the Stono River, has retained its pastoral charm, a veritable sea of tranquility surrounded by the comparatively hurried pace of the rest of the fast-growing Carolina coast. The residential communities that have been established on the second largest island on the East Coast have been built to blend in with the natural environment, adding to the beauty of the island's magnificent marshes, fertile fields and age-old forests. Johns Island is probably best known for the Angel Oak, a huge and ancient tree that sprouted around 10 centuries before Columbus sailed for the New World. Thought to be at least 1,400 years old, it is among the oldest living things east of the Mississippi River.
" Despite its proximity to Charleston, Johns Island, located just across the Stono River, has retained its pastoral charm. 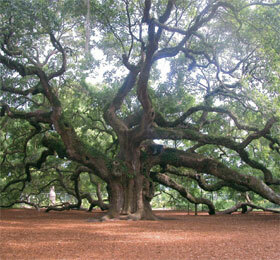 ... "
Live oaks usually grow out instead of up, but the Angel Oak has done both. In a wooded area along Bohicket Road, it rises 65 feet high and boasts a canopy that provides 17,000 square feet of shade. Some of its massive limbs are so large and heavy that they rest on the ground and, in some cases, drop underground for a few feet. The Angel Oak has survived hurricanes, floods, earthquakes and the human race, though it was damaged by Hurricane Hugo in 1989. Numerous artistic events are held at the Angel Oak, especially during Charleston's Spoleto Festival in May and June. The Angel Oak is a tribute to the history of the Carolinas, a witness to all that has taken place along the Southeast coast for a millennium-and-a-half or longer. This living link to the past represents part of the reason potential homeowners are drawn to Johns Island, a pastoral paradise now just minutes from downtown Charleston, thanks to the newly-completed Stono River bridges, which tie the island to the 21st century. Johns Island is the ideal place for people who want to live a rural lifestyle with the modern world just a short drive away.